Cannot close out (x out) videos because “x” button location in top right corner conflicts with iPhone screens command center pull down feature. Have close out app and reopen to continue reading news - just don’t watch anything video related. Stupid UI/UX iOS bug. Who does your testing? 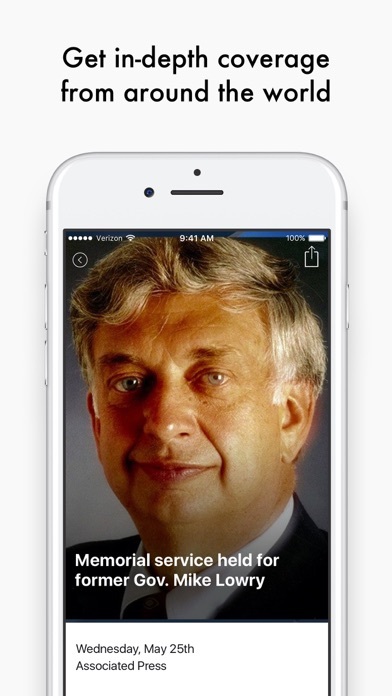 This app looks like it would be great. 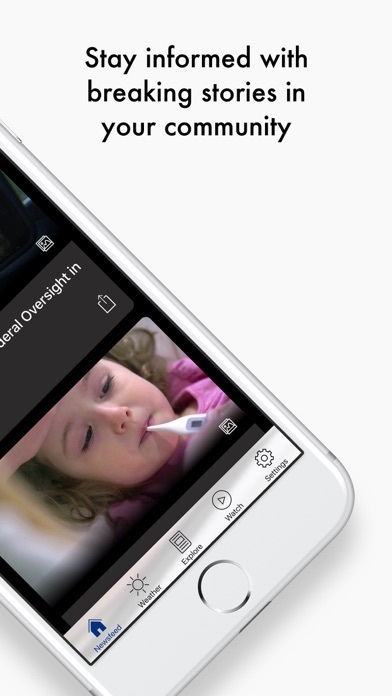 You get the ability to watch the news in the morning on the app and don’t need to turn on the TV. Now if they would only add sound to the app it would get a 5 star review. Just a pipeline for BS content and fact free faux news to reach your phone. The interface is as terrible as the mush it pushes. Take a hard pass on this app. The app lacks a lot of in app functionality and launches a browser window to open almost everything, rendering the app basically useless because it’s an extra step to access articles directly via the mobile website. If more pages were directly embedded within the app the pages would load faster and the app would be more enjoyable to navigate. Not a fan will uninstall. I used to receive sound on my apple products now nothing, your forcing me to go to KIRO, yikes. Please hire a IT person to do their job correctly, for Christ sakes this Seattle, not Yakima. Sound doesn't play during videos, and I know it's the app because I am getting sound in other apps just fine. In order to get through all the news you have to close the app and reopen it again as the screen freezes. It does it on those generations of iPads that we own. And iPad air two and an iPad Pro. Fix this please! This stopped working a while ago so I uninstalled it. Just downloaded the new one and it was a fail. It’s like Komo is the poorest tv station in Seattle. This app drained 30% of the IPhone power while I ate my breakfast! It’s almost all good. Some of the recent improvements, like the handling of pictures, are great. The “listen live” feature needs a lot of improvement. It constantly cuts in & out. It seems there is more time where it isn’t working than is. I’m usually connected to a WiFi network when listening but I’ve tried turning the WiFi off & it doesn’t seem to make a difference. While I like waiting your news on TV, I some times miss the show and want to watch it at a later time. This app does not cut it so I’ll be deleting it. Let me know when you have landscape available and cached programs available and I’ll re-load it. I’ve used this app for years while commuting to work. I don’t know what you did in the latest update, but it’s terrible. Cuts out constantly, I’ll be changing to another station. Years ago there were similar issues, in the early stages of apps, there’s no excuse now. I was hopeful that their app would preform better than their website (since that is very sluggish) but was wrong. The news feed tab doesn’t load anything not the weather tab. It’s a shame because I like their news content but they don’t make it easy other than watching it on TV. I don’t mind ads, but it’s the same product between EVERY video. Good content. The wine ads are a game changer for me. When I see them when I open it, I shut it down. Will uninstall soon. This is all print stories, no video. Why bother with this? I could read these on any news feed. The video is what would make this worth my time. You can't see it in landscape mode for the iPad. Make the app where you can rotate to any position. Also the ads should not look like the news stories. Be careful what you click on or you will the ad instead of a news article. Content is ok but what really annoys me is the constant freezing of this app. Scroll, freeze, force shut, reopen is a daily occurrence. Get your fake news here. Audio is working when the phone is not in silent mode. I have my iPad mini set in a stand in landscape orientation, and I have to set it to portrait to read and watch live. Live will move to landscape when I change, but i have to move it first. Other apps will already recognize the orientation. Also my biggest negative with KOMO and this app is their repeated annoying komo ad. Why can’t they fill ad space with something else or air the normal ads as on tv. Anyway, going to use other network apps. Thank you so much for the coverage on the train derailment. You really helped the major networks understand what happened! Whenever I open the app, the stories are old. Even after restarting/refreshing/everything possible, the articles are always 9+ hrs old. This app’s content is updated about once every 24 hours. It is not updated again till the next day. It is less accurate than a stopped clock. 10/2/17 I am removing this app from my iPhone and iPad because of the company’s exceptionally poor update schedule. Ten hours after the Las Vegas shooting there was no update that it had even happened. Really a crappy service. 11/22/17 Got a note from the app developer saying they solved the update problem. WRONG! The problem is that KOMO’s news department is so understaffed they can’t provide enough news to do news updates! KING does. KOMO does not. It works well enough, I really wish they included the ability to filter what type of push notifications you get. They send 15 million Seahawks notifications and I couldn't care any less about the team or the NFL. To be able to turn off sports or Seahawks notifications would be great. I've disabled all notifications as a result. This app doesn't like you watching live broadcasts. It constantly repeats a komo 4 advertisement. Over & over. When I watch on the regular tv, the app is still repeating the same advertisement, either komo 4 ad or a honda ad. Very frustrating. 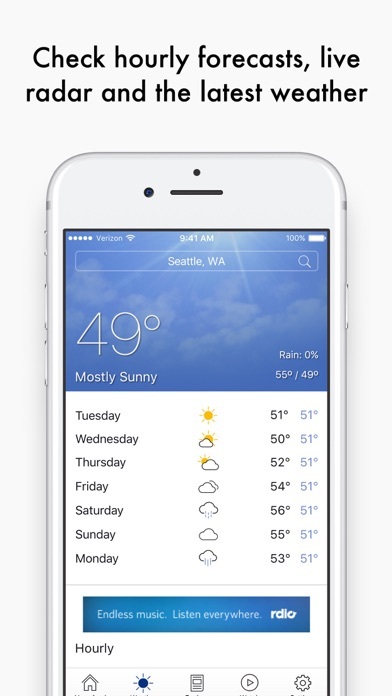 King 5, KIRO 7, Q13 apps actually work great. 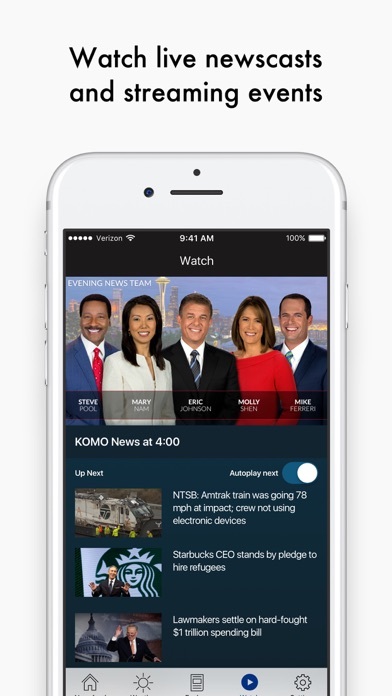 Even better, kiro 7 has an Apple TV app. Komo was actually better when Fischer owned KOMO. Sinclair seems more concerned about politics than the viewers it serves. Latest update fixed crash at startup on my iPad 3. Application is working well now. Thx! 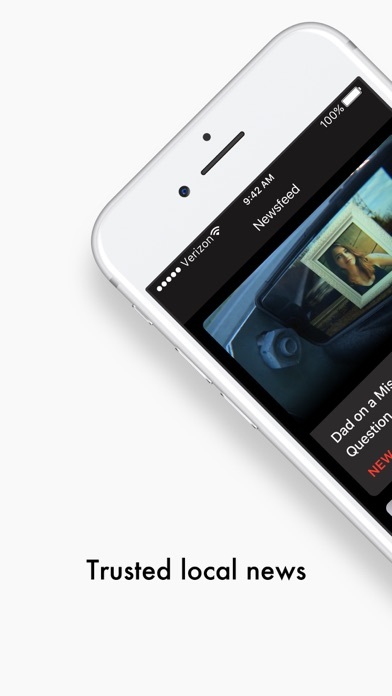 Thanks for fixing up my favorite news app. I downloaded the app because the web based live stream freezes so much I was hoping it would be better here. Unfortunately, this app won't play sound during video stream. I've reloaded the app twice thinking it just installed incorrectly and so far no change. It plays video quickly for the live stream but has no sound on both my phone and iPad. Bummer. I don't know how much beta testing went into this latest version, but it simply doesn't work. Suggest the developers try to download and pretend to be an user. This version is a bust. It will no longer open! This new updated app doesn't work at all. Crashes every time. 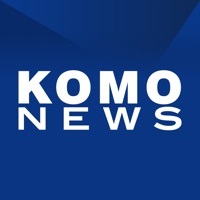 KOMO is the only news app I have that doesn't adapt to landscape or upside down portrait position. I occasionally use my iPad upside down while plugged in, but the app won't rotate to support this, so I revert to other local news sites which ALL have screen rotation ability. KOMO usually presents its news with a viewpoint, an extreme far left point of view that the fascistic, socialistic residents of Seattle no doubt approve of. The amount of ads in this news app is RIDICULOUS! Am not happy with this app. Does not refresh to current stories when opened. Have had to unload and reload app several times to do this. iPad version doesn't rotate into landscape mode so you can't read or watch using your cover stand. Not user friendly at all and can't find stories that it alerts u too!! If I get a notification for breaking news, it'd be nice if when opening that item from the notification that the app actually take you to the breaking news story. Once in the app, I can never find the story that I was notified about. Please fix this! This App is horrid. I've had nothing but crash issues. It doesn't navigate well through the site. There is no visual appeal to it. There is nothing to recommend this app. The latest app upgrade doesn't work, at least on my iPhone. I select a story the picture of the story appear but no text and the app freezes. would try this but turns screen upside-down. I use portrait mode with home button at top so I don't bend the lightening cable against my stomach while working and charging or using a monitor. Note: app support button doesn't work Also no support option on the website. the devil is in the details hope your news is better than your support.